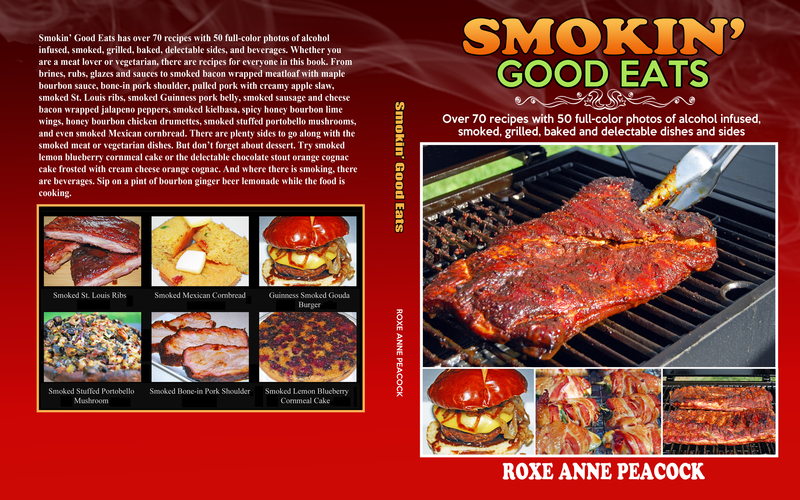 Smokin’ Good Eats has over 70 recipes with 50 full-color photos of alcohol infused, smoked, grilled, baked, delectable sides, and beverages. Whether you are a meat lover or vegetarian, there are recipes for everyone in this book. From brines, rubs, glazes and sauces to smoked bacon wrapped meatloaf with maple bourbon sauce, bone-in pork shoulder, pulled pork with creamy apple slaw, smoked St. Louis ribs, smoked Guinness pork belly, smoked sausage, and cheese bacon wrapped jalapeno peppers, smoked kielbasa, spicy honey bourbon lime wings, honey bourbon chicken drumettes, smoked stuffed Portobello mushrooms, and even smoked Mexican cornbread. There are plenty sides to go along with the smoked meat or vegetarian dishes. But don’t forget about dessert. Try smoked lemon blueberry cornmeal cake or the delectable chocolate stout orange cognac cake frosted with cream cheese orange cognac. And where there is smoking, there are beverages. Sip on a pint of bourbon ginger beer lemonade while the food is cooking.